3M Aquapure Reverse Osmosis filters provide good RO filtered water to many different applications including for drinking or icemakers. 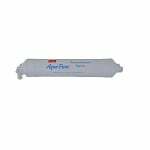 The Aqua-Pure AP5500RM is the replacement TFC membrane for the AquaPure RO5500 reverse osmosis system. The Aqua-Pure RO5500RM TFC membrane module should be replaced every 3-5 years based on the quality of water coming into the system.